This is a fun formula that I like. I used to wear it a lot when I worked in a lab, but wear it much less now that I work in an office. Still, it comes out from time to time when I need/crave a change. I also do a version with a column of navy/ink, especially in wamer weather, with silver accents. These are all great ideas for me for work. Thanks for this – I now know what I’m wearing for a full day on Saturday: black floral print chiffon shirt dress over black ponte crop flares, and black mules. I like this idea. As a longer legged person who prefers dresses just below the knee, using a shorter dress as a tunic often works well. Also like this look with a longer dress for a bit of drama, On breezy days, this look makes wearing a dress more practical. I’m all in and still experimenting with proportions and silhouettes. Appreciate the examples. Tanya, the column of ink with silver sounds lovely. Lisa P, glad you're inspired. Nice with your light blue bag. Eliza, YES. I like both dress lengths too. I like your outfit best of all. This is an outfit formula I’ve not worn in months and now wonder why because I have a couple of wool dresses kept for this purpose. Thank you for the reminder that the pants are not leggings. This doesn’t usually work for me unless the pants are very skinny – I do like #3, probably for that reason. Since I am so short it tends to just look like my top is too long. I can do a long vest but that seems different for some reason. I’ve done this occasionally in the past, and have maybe a couple of pieces that would make it work, but it’s not exactly an effortless look for me — it’s tricky to find the right combination that creates good proportions and isn’t fussy or bulky feeling. I like these examples though. Hmm…. I have the pants, will have to look at the dresses. If nothing else, I have a couple of black tunics I haven’t been wearing. I love the look but always feel bulky in a dress worn over pants probably because I haven’t got the right combination of pieces for this look. I like wearing my wrap dresses this way as then I don’t have to worry about wardrobe malfunctions. I love this look and have been wearing some iteration of it for years. I was just thinking about this formula a few days ago… I can’t tell you how many times I am pondering some fashion idea and boom! Angie posts about it. I feel like I need some new black over layers now. Also, looking for a light blue purse (I’ve seen this mentioned twice on the forum, here referencing LisaP’s, and someone else recently posted their purchase. I agree that a light blue bag would go with ever so much! I’ve been wearing a black dress over dark blue slim jeans as a sort of travel uniform. I also wear a column of black with a patterned or colored topper (stylin’ jean jacket, colorful kimonos, jackets, etc). Again, these are a good forumula for work, because it’s easy to move alot and the longer layer gives me good coverage, which is good when I’m providing hand-over-hand playing a drum or ukulele. I’m working on refining my proportions with this sort of formula, since the outfits are really fab when the silhouette is right! I have always loved the dress-over-trousers silhouette, and don’t think that will ever stop:-) These are all great, I would just pick a different colour than black for myself. This is a look I’ve never tried. I quite like #1. I”ve worn shorter dresses this way but have yet to try longer lengths. I would love to see you in your black outfit. I haven’t done this in quite some time. I like the look of a shorter dress with a cigarette or legging. I have a problem with dresses over pants (true pants, not leggings) because my mother used to make me wear long pants under dresses in winter. She thought I should only wear dresses to school, so she’d just have me wear a dress and then slap random corduroys underneath. I’ll think on whether I can get past this somewhat limiting aversion. Of course I’m drawn to the arty and architectural example! I’ve worn a black dress over black pants before. I will have to bring out that combo again. 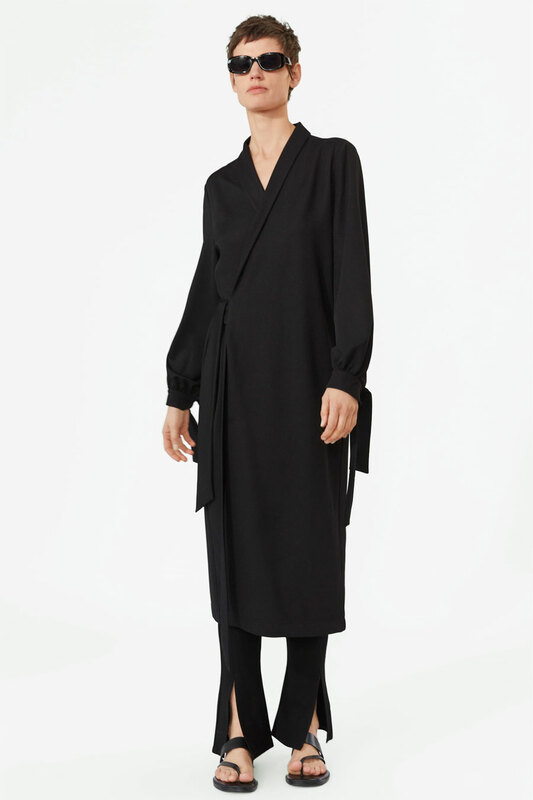 My black dress is a long lightweight linen caftan style, and I wore it over lightweight cotton pants rolled to above the ankle. I love how these look but I feel in reality that the pants create a lot of bulk in my midsection. I prefer to wear leggings with dresses (which I realize is a completely different look) because they’re less bulky and more streamlined. I think the silhouette is fun, but I think I ODed on black in my 20s, and I just can’t do all black anymore. Good to hear your thoughts on the look, ladies. Joy, thank you, and look forward to seeing your version. Robin F, shortening the length of the tunic world well. Janet and bonnie, I’ve seen you pull off this look with panache. Inge, you can do blue. Taylor, FashIntern and Firecracker, excited to see what you come up with. April, HAH! Let me know how that thinking goes. Sara L, you minimize the bulk with a fluid dress. Ooohhh, I’m excited to try this! I haven’t worn my Leith pants with the front leg zips in awhile, so I am going to experiement with #2. Angie, do you think my plaid Uniqlo tunic can be worn with bootcuts like #1? It’s not a fitted tunic. These midi dresses over pants….is that only for tall gals? I love this look but its not flattering on my shape. Tunics, shirt dresses and shift dresses end up hiding my shape and making me look bulky. I will envy and enjoy it on others. My favorites are #1 and #3. This is a great look that I rarely wear these days. I do enjoy seeing it on others. I prefer #1, for its elegance. This is also the only way I’ll wear short (= above the knee) dresses–as tunics over trousers (or skirts). 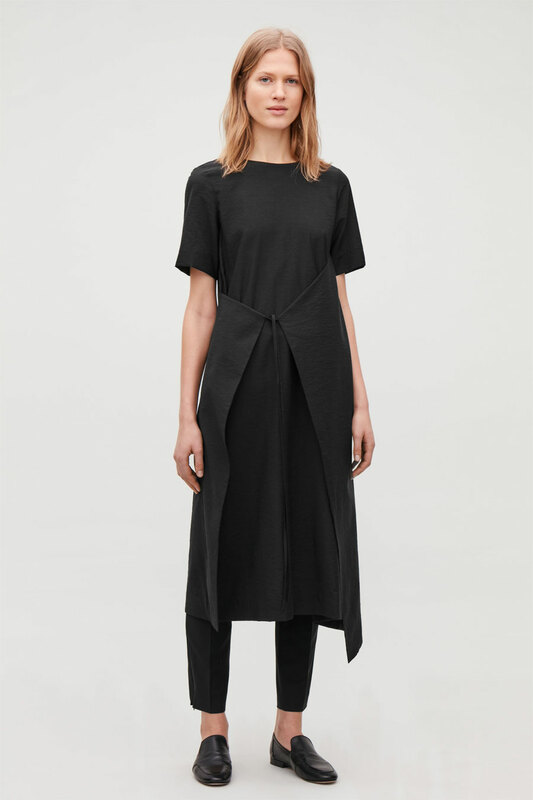 My version would be a sleeveless short black pleather dress worn over long black flared trousers and a non-black long-sleeved turtleneck pullover or blouse. I did a version of a loose black dress over ponte pants a couple weeks ago. Was sort of arty, I guess, but think asymmetrical could have worked better. I could most see myself in #3, but I don’t currently have black pants in my wardrobe! )That will change once I find the right replacement pair.) You’re absolutely right, though. I’m imagining that same look with leopard footwear, and it’s stunning! I’m drawn to #3… I would need a longer dress/tunic than the few dresses I have in my closet. I could do the column of color – dark purple – with alternate pieces… a shorter dress, ankle length leggings and a duster that’s close in color. Not quite the same effect…but available in my closet. Definitely need to find some metallic or leopard flats next time I’m in town. I am SO attracted to this when done as a monochrome look, not so crazy about look number four. It looks powerful as well as feminine, a female version of a man’s suit. I’d like to see someone manufacture the two pieces from the same fabric, specifically made to be worn as a ‘suit’. I think this is a good use of the ankle slit pants, to add some interesting detail to the bottom half. It’s a firm yes from me! I don’t wear this combination often but always enjoy it when I do. It’s very easy and comfortable. Maybe I’ll play around with my new side-slit pants and some variation on the formula. I’ve worn this look for years, and really love it. Doubt I’ll ever stop wearing it. However, for me it’s a winter look. In my neck of the woods, any pants but shorts are too hot for summer, and I’m not about to toss a dress over them. 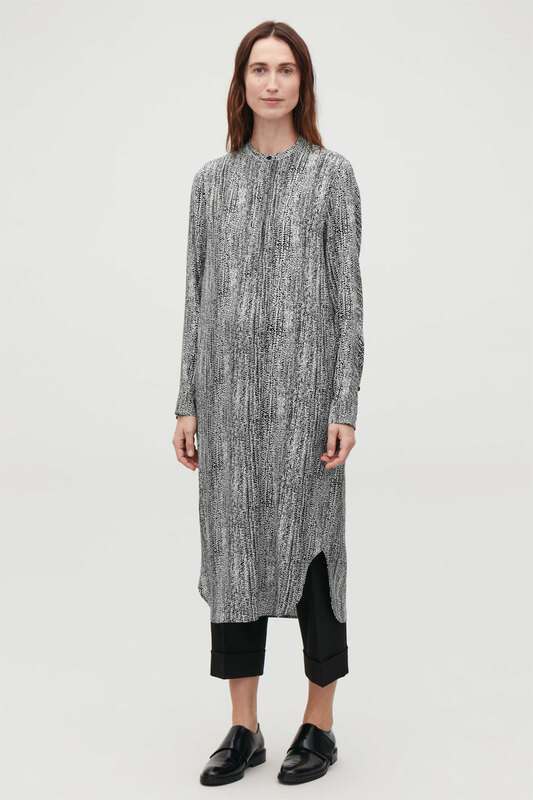 #1 with the shorter length tunic is one that I’ve been wearing a lot this winter. I do not care for the longer lengths over pants, but never say never – if the right combination presented itself, I’d try it. Angie, what do you think about the jolette in argento? Basically looks like metallic silver. What to wear with them? Black pants with white or black on top? I have four pairs of this shoe and covet your red ones. Your versions sound fab, ladies. I hope to see them on the forum. Jeanne, metallics are very neutral. Wear them with just about anything. Does the argento bookend your hair? I love wearing straight cut black pants under shorter dresses that I would otherwise not wear. It seems more interesting to me right now than leggings. My favorite above is #1 – I would love to wear it exactly as shown but in dark blue! These silhouettes are similar to a lot of traditional and fusion Indian wear. so as much as I enjoy the look on others, somehow I always feel like it looks off on me! Love the Arty and Architectural one. RainB, I’m sure you wear it with panache.